For many of us, Mondays aren’t our favorite. So perhaps this card is reminding us to try to embrace it with a little playfulness and a positive mindset. Or perhaps you need a break from routine, regardless of the day of the week. Is someone being silly? Perhaps you should join in instead of rolling your eyes or going about your business. Otter is one of my spirit guides, reminding me to not be too serious and to enjoy life. May she remind you of that too. Blessings! Meaning: Otter invites us to play, to go with the flow of life and experience – to become a child again. Allow yourself the freedom and pleasure of relaxing and letting go of all your daily concerns. 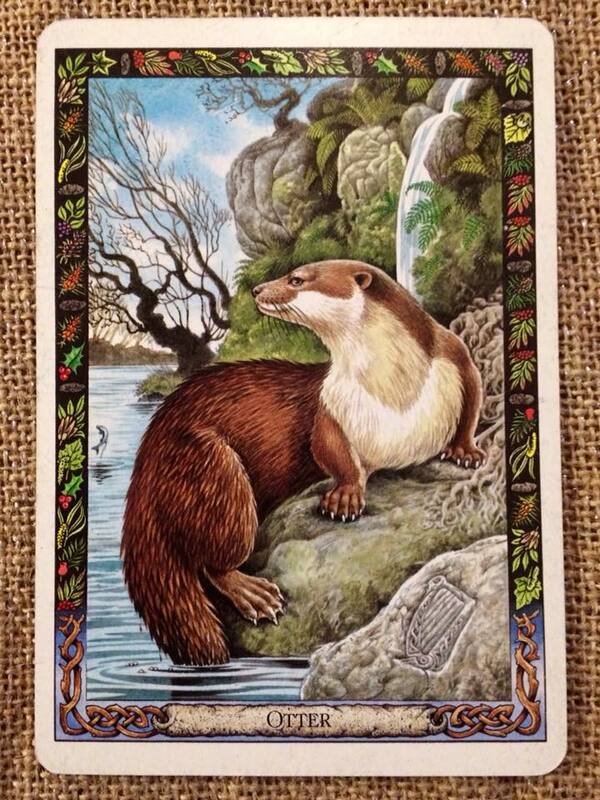 Otter could be prompting you to take a day or a weekend out of your usual routine to do something purely for fun. Your practical side may tell you that you cannot afford the time, but deep down you know that you need to care for yourself to be a real value to others. Someone may even be coming into your life who will show you how to play again – something you may have forgotten as you excepted the responsibilities of growing up. Otter shows us that being playful can lead us to catch the salmon – the fish prized by the druids as the totem of wisdom. Drawing this card also confirms to us the sense that we are truly protected. This card can also suggest that you may be “pushing the river “– going against the natural course of events, perhaps out of fear or stubbornness. Try letting go, relaxing, and trusting in life. Although Otter urges us to be playful, we must be aware of becoming the play boy or girl who uses play as an escape from the demands and responsibilities of adulthood.